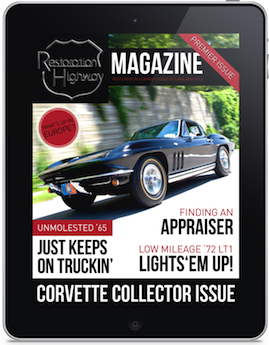 Restoration Highway Magazine is all about restoring/servicing all-American muscle cars, from 1960 to present day. If you’d like the adrenaline rush of a fast car, this mag is for you. While some mags specialize in just cars from the 1960s and 1970s, Restoration Highway Magazine is all about the American muscle car culture, the incredible performance and detailed specifications of them all. For a complete rundown about Alan’s brand-new Restoration Highway Magazine including a sneak peek inside the publication, click here for more details. Connect with like-minded classic car enthusiasts through webinars, articles, videos and our classic car forum. Are you an antique car hobbyist, automotive business professional or simply a classic car enthusiast? AlanColvin.com, founded by one of the nation’s top collector car experts, is your one-stop-shop for all the information you need to feed your automotive addiction. Visit our Braking News section to swap stories and information with Alan Colvin, author of the “Chevrolet by the Numbers” and “Corvette by the Numbers” series, and former Corvette Fever Magazine editor. You’ll leave more in love with classic cars than when you arrived! Check out Restoration Highway Television. Interested in sponsorship or distribution opportunities?